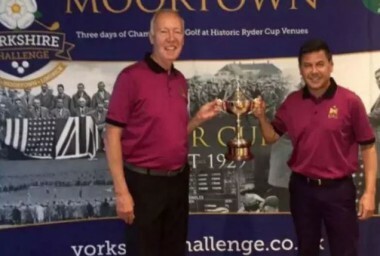 KNARESBOROUGH’S Kevin Walsh and Gary Young will begin their defence of the Yorkshire Challenge today as the county’s three Ryder Cup venues host the fifth staging of this increasingly popular three-day pairs event. More than 200 other pairings will be looking to deny them a repeat success over Lindrick, Ganton and Moortown as they compete in three divisions – each named after the course on which they begin their pursuit of overall as well as divisional glory. Walsh and Young tee it up at Lindrick today, where they laid the foundations for their 2016 triumph by claiming 46pts before adding 37 at Ganton and 39 at Moortown to win by a point from Kenilworth duo James and Will Lamond. Walsh’s handicap has dropped two shots to 19 since last year while Young will again be off 12. Walsh explained: “I think it was probably tiredness, but I love the Yorkshire Challenge because it is such a great test of golf. “It is a super event, it is so well organised, and it is lovely to just be a part of the leaderboard let alone be top of the leaderboard. It is just lovely to come off the course and see your name on the leaderboard. A little tingle goes up your back. It is a proper competition. “You have to be consistent and you do have to play as a team and that yin and yang when it works for you is super.” The duo used to work together for KCOM, formerly known as Kingston Communications, before Walsh’s retirement and have been competing as a golf pairing for some years. Young continued: “I have a huge love of the Ryder Cup generally and it is something I look forward to almost more than every other sporting event, apart from maybe the Rugby World Cup or the Super Bowl. My wife and my three boys, Joe, James and Callum, we all really get into it. “Having been such a huge fan of the Ryder Cup for such a long time, to get to play on these courses is special. They are special courses anyway, but knowing that they have hosted the Ryder Cup makes them extra special. “The courses are challenging and enjoyable, and the organisation of the Yorkshire Challenge is fantastic. The organisers are making it better every year and they look after us so well. It is just really well done.” As to the task of defying those other pairings to keep their grip on the trophy, Walsh said: “It is going to be more of a test this year with me having two shots fewer, but Gary is a cracking golfer when he is on form, he really is. “It will be a case of keeping each other’s confidence up. We do sometimes change the order of who tees off first if things are not going well. It is just to introduce something different so your brain thinks about something different. “If Gary is whacking it out of sight and I’m on the tee after him and thinking, ‘I can’t hit it that far’ sometimes you might switch it so I’m not worrying about trying to whack it out of sight too. “All the chaps you play against are really good golfers as well. The adrenaline shoots in on some of the holes, certainly the first few holes, and you try to control that because it is competition conditions. “They announce you on the first tee – there’s a guy there who is giving you the spiel – and do you think, “this is real golf”. A free, live score-tracking app will be available to all competitors throughout the three days of competition to allow them to monitor scoring as each scorecard is submitted.